Sophia Wiedeman's comics continue to be elegant, restrained and scratchy in a way that adds a visceral layer to the reading experience. Looking at her 2015 mini, Semisolid, one can see how her line has become more confident, with no extraneous rendering. That said, when she requires a greater degree of naturalistic density, her hatching and stippling skills are more than up to the task. Her storytelling was always poetic and evocative, but she's truly developed the drawing chops to effectively tackle any subject without distracting the reader with figures or objects that are just a bit wobbly. Wiedeman's ability to draw faces in a style that straddles the line between naturalism and a more iconic approach is one of her most distinctive visual signatures, especially when the eyes of her characters are the color of burnt-out embers. In this story, we follow a woman (possibly a stand-in for the artist) who is literally trying to draw her way into something. The panels of the page become large sheets of paper that she's drawing on, until finally a door appears on one and she grasps its handle. She emerges into a landscape with a withered tree that begins to fill with sand. After a moment of seeming impassivity, she finally extricates herself from the room and shuts the door. She's now in a complex of rooms and halls and happens upon something decaying, flies buzzing around it. When the flies start to swarm and chase her, she runs to another door and this time sees a huge blob sitting in the sand. 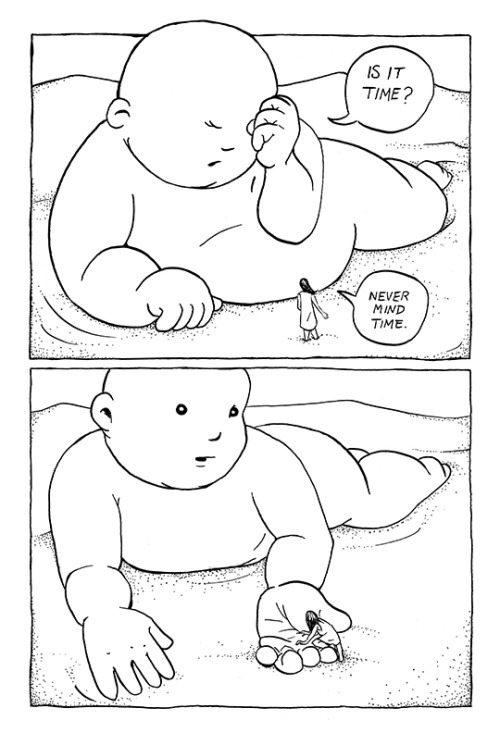 Upon closer inspection, it's a giant baby, and she begs for its help after it asks "Is it time?". Its response was to swallow her whole and tell her "You know what happens now". 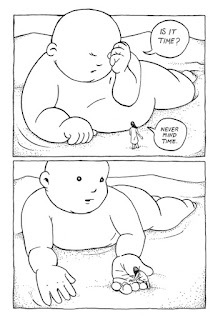 The baby changes shape, turning into a marsh and then a forest where she wakes up. She spies a caterpillar and holds it in her hand, til she turns over and lies on her back--revealing a bulge in her stomach. 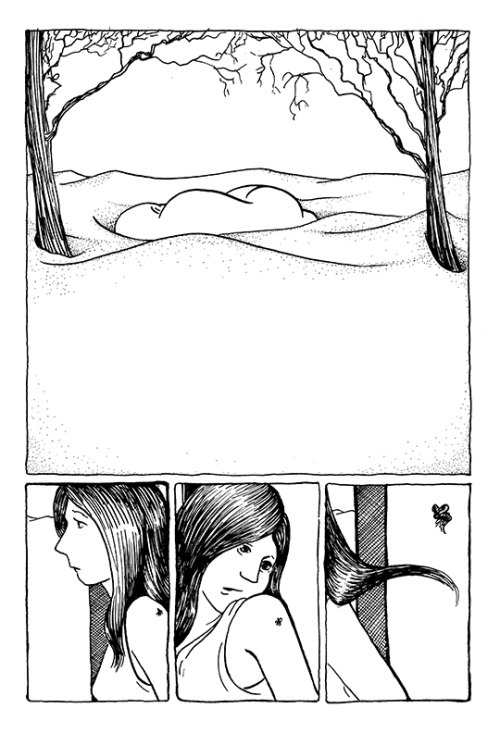 Clearly, this is not only a comic about becoming pregnant, but it's also one about the process of transformation as a whole. The rotting pile of decay perhaps represents the decision to abort a previous child, with the flies' insistent aggressiveness being a manifestation of lingering or unprocessed guilt. This is a journey that took her a great deal of effort to make, and while it may not have been time (there so rarely is a perfect time to have a child, though some are obviously much worse than others), it was clear that there was a need to sweep out the detritus in her brain and move on. That caterpillar, on its journey to transformation, was a clear metaphor for her own journey that was about to begin Wiedeman hints that while giving birth is certainly transformational in its own way, the real barrier here is the woman's attitude toward giving birth and the ability to discard and reshape her feelings. It's a beautiful, fascinating comic that offers the readers a number of clues but never spells things out. Overripe is a collection with a couple of stories in it. The first is about a beloved dog rendered with an appealing gray wash. Wiedeman does a great job drawing the dog, which is the type which is essentially a four-legged carpet. The scribbles, squiggles and loops that made up the dog oddly gave it a sense of realness that a more naturalistic drawing might not have captured, because the squiggles made it easier to depict the dog's emotions and body language. 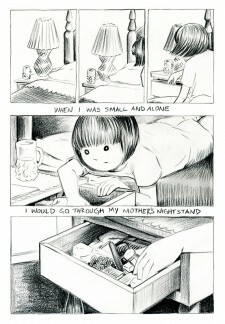 The second long story, "Night Stand", is about Wiedeman's childhood proclivity for running through her mother's night stand. The feathery gray wash is exquisitely rendered, perfect for a story about memory and identity. In reading, smelling, using or eating everything she found, Wiedeman says she was "consuming her piece by piece". Not in the sense of using her up, but rather loving her so much that she wanted to know her totally, almost in a desire to see the world precisely through her eyes. It gets at the problem of human connection, where no matter how much we might love someone, we can never truly know them, never show true empathy because of how our bodies and minds are separated. Wiedeman suggests that over time (there's a beautifully-rendered sequence where the different shoes she wears indicates how she kept coming back to this practice), she knew her as best as she could--and she was ready to return the favor one day with her own night table. This is a beautiful, moving story that is still told with a sense of restraint, both in terms of the text and the visuals. There are also some interesting short pieces here exploring shapes, including a character falling across a nine-panel grid and another featuring ink drip down from panels in another grid, as well as a funny rendering of a worm speaking Spanish.